Tom Brown is Toronto’s foremost Weather Anchor. In April, 2009, Brown took over as Weather Anchor for CTV NEWS AT SIX and 11:30 PM, for a retiring Dave Devall. Brown joined the CTV NEWS TORONTO as Weather Anchor and a live roaming reporter on the CTV NEWS AT NOON in early 2004. Brown grew up in The Beaches area of Toronto, ON and studied broadcasting at Fanshawe College in London, ON. After graduation, Brown left his home town of Toronto to pursue his broadcasting aspirations. Before moving into television, Brown worked in several Canadian radio markets, including Moncton, Winnipeg and Regina. After filling in for the weather anchor at a Regina television network, Brown stayed with television and never looked back. 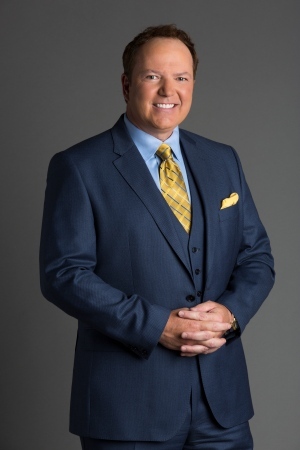 His live weather broadcasts from various locations across the Greater Toronto Area have become his trademark and have taken him to famous landmarks including The Ontario Science Centre, Centreville, the CN Tower and Ontario Place. Some of Brown’s most memorable weather reports have included reporting along side two Canadian Prime Ministers, being lifted up by an elephant and rappelling from a 26-storey building. Ever the show man, in March, 2012 Brown was a contestant on THE PRICE IS RIGHT. Brown is passionate about causes to benefit children with special needs and regularly participates in events to benefit the Durham Region Down Syndrome Association. Every year he acts as Master of Ceremonies for the “Walk So Kids Can Talk” for Kids Helphone, The Cystic Fibrosis Society “Great Strides” walkathon and The Children’s Charity Variety Village ‘Walk-n-Roll’ annual fundraiser. In recognition of his dedication and support of children’s charities, Brown was the recipient of Variety Village’s 2011 Spotlight Award. In addition, he champions children’s health services at The Hospital for Sick Children, Princess Margaret Hospital and Oshawa Hospital Foundation. Each year, Brown spearheads CTV Toronto’s annual Toy Mountain campaign to make wishes come true on Christmas morning for thousands of children across the Greater Toronto Area. He regularly visits schools across the GTA, to champion their charity and educational community contributions live on CTV NEWS AT SIX. Brown is extremely supportive of the Canadian Cancer Society and their efforts to raise funds for cancer research and support services. For the last four years, Brown has served as Master of Ceremonies for the organization’s annual “Cops for Cancer” fundraiser in Toronto’s Peel Region. Brown likewise supports the Peel Regional Police Service, the Ontario Provincial Police and various emergency services, and all who are involved in the fight against cancer. Brown is proud to call Toronto home, with his wife and two children. He loves working at CTV Toronto, the station he grew up watching.